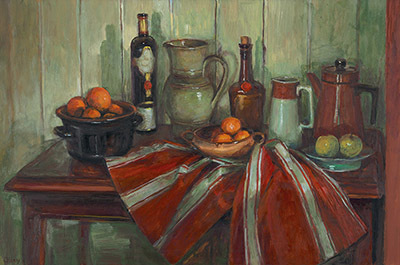 Margaret Olley is one of Australia’s most well-renowned painters of the still-life subject, her legacy to Australian art history is significant and her characteristic interior scenes are highly regarded and collected worldwide. Throughout her long and successful career, the still life was the focus of her artistic production, eschewing the trends which were engaging her contemporaries in favour of the thoughtful, harmonious domestic scenes which became her unique oeuvre. Margaret Olley’s life was as busy and full as her colourful still life compositions – she had more than ninety solo exhibitions of her work and was awarded an Order of Australia in 1991. The Margaret Olley Art Centre at the Tweed Regional Gallery in Murwillumbah is a tribute to the artist and the significant contribution she made to Australian art.